Side mount flange plate. Powdercoated with a durable black finish. 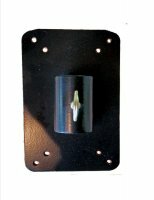 It's perfect for mounting nest boxes and one-sided feeders, also accommodates side mount bluebird houses on any of our 1" Diameter Poles Thumb screw secures feeder to pole. Zinc plated mounting screws included. Flat Vertical plate measures 5-5/8" x 3-1/4". Made with 12 gauge (.104) plate and mig welded for maximum strength. Made in USA.